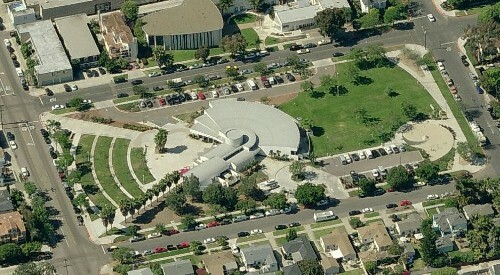 The Friends of the Pacific Beach Library (FOPBL) exists to support the operation of the Pacific Beach/Taylor Branch Library. The Friends, through volunteer services, assists library patrons, hosts special events, operates a used book sale, and provides financial support for acquisitions and community activities. Chartered under the auspices of the Friends of the San Diego Public Library, the Friends of the Pacific Beach Library is an official §501(c)(3) non-profit, educational organization. As such, donations made to the Friends are tax-deductible to the extent allowed by law under Internal Revenue Service tax regulations. The Friends of the Pacific Beach Library meet on the second Wednesday of the month at 3:00 p.m. in the Library's Meeting Room/Gallery. Meetings are held every month except June, July, August, and December. 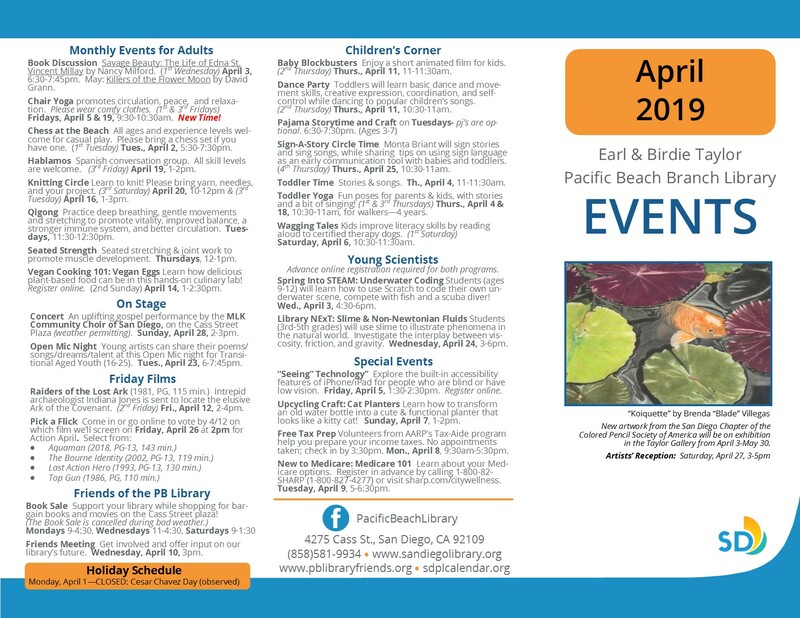 Please feel free to explore this web site to learn about the services provided by the Friends and by the Pacific Beach/Taylor Branch Library itself. 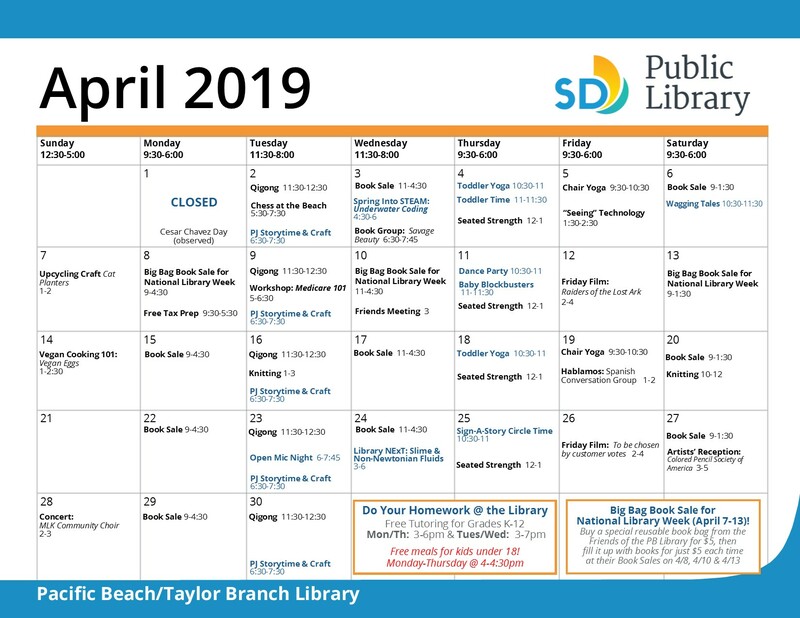 Multiple versions of a downloadable monthly calendar are available that show all events scheduled to be held at the Pacific Beach Library. The calendars may be viewed, saved on your computer or mobile device, or printed for use throughout the month. Also, for ease of reference, the PDF and JPG versions of the calendar list events categorized by age group and general area of interest. Please click on one of the links below to download or view the calendar. For patrons who prefer a pre-printed calendar on paper, please ask one of the library's staff members to print one out for you when you come to visit the library. 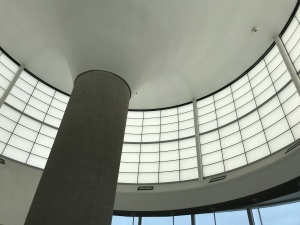 Interested in what's happening at ALL San Diego Public Library branches, including the Central Library? If so, (==> Click Here <==). New artwork from the San Diego Chapter of the Colored Pencil Society of America will be on exhibition in the Taylor Gallery/Community Room of the Pacific Beach Library from April 3 through May 30. An artist's reception will be held Saturday, April 27, from 3:00 to 5:00 pm. Admission is free. (==> Click Here <==) for a printable copy of the 2018-2019 Do Your Homework @ the Library calendar. Support your library while shopping for bargain books, DVD movies, audio books, music CDs, and an occasional special treasure. Indoor Book Sale: A selection of gently used hardcover and softcover books is available for purchase at bargain prices inside the Pacific Beach Library whenever the library is open. This book sale benefits the Friends of the Pacific Beach Library which, in turn, benefits the library as well as many of the programs offered by the library. Look for the sale books across from the circulation desk near the Reed Street entrance. Payment can be made at the circulation desk. Outdoor Book Sale: The Friends' Book Sale is conducted outside the library on the Cass Street Plaza, on Mondays from 9:30 AM to 4:30 PM, Wednesdays from 11:30 AM to 4:30 PM and Saturdays from 9:30 AM to 1:30 PM every week. The Outdoor Book Sale is cancelled during City holidays, inclement weather, and may close early when it gets too dark to see outside. If uncertain, please call the library at 858-581-9934 to verify if the book sale will be held that day. Monta Briant, local mommy and author of Baby Sign Language Basics and Sign, Sing, and Play will sign stories and lead us in songs, fingerplays, and games and share tips on using sign language as an early communication tool with preverbal babies and toddlers. Sign-A-Story Circle Time is held on the 4th Thursday of every month, except November and December. Seated stretching and joint work to promote muscle development. Seated Strength is held every Thursday. You are invited to a reception for an art exhibit in the library's gallery. New artwork from the San Diego Chapter of the Colored Pencil Society of America will be on exhibition in the Taylor Gallery from April 3 through May 30. An Artists' Reception will be held on Saturday, April 27, from 3:00 to 5:00 pm. Light refreshments will be served. Admission is free. 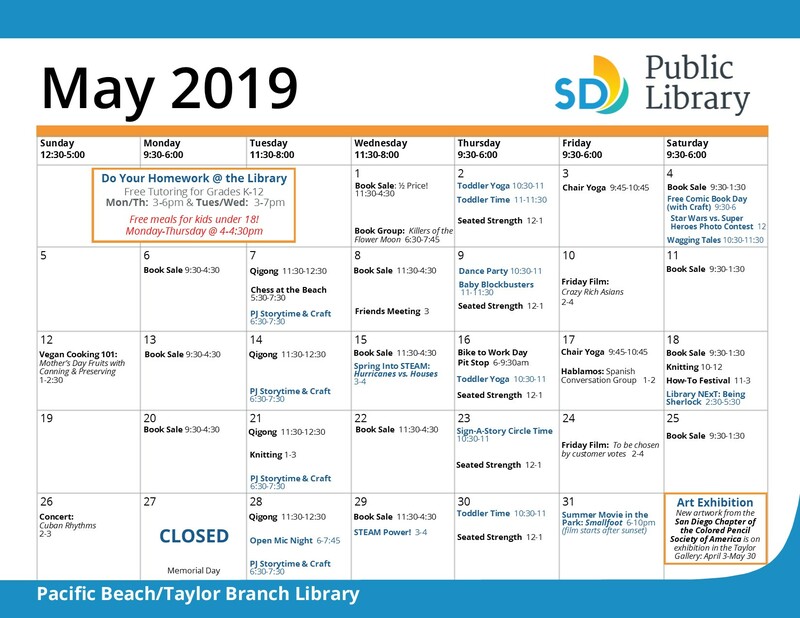 The Friends of the Pacific Beach Library's Library Music Series features a free concert at the Taylor Library on the last Sunday of each month. Today's concert features an uplifting gospel performance by The Martin Luther King Community Choir. Admission is free; donations are gladly accepted. 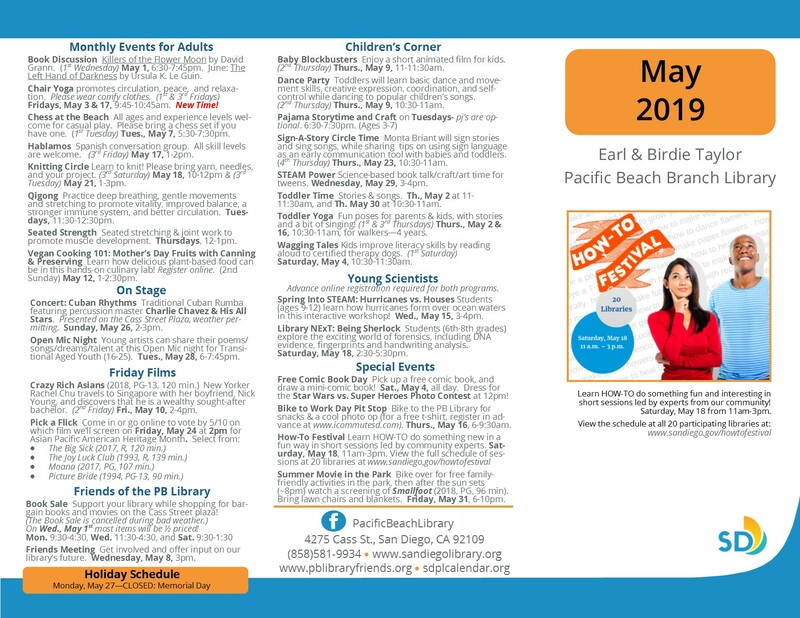 (==> Click Here <==) to visit the Friends of the Pacific Beach Library Concert Webpage for details about the Free Concert Series, including a schedule for the 2019 concert season. Practice deep breathing, gentle movements, and stretching to promote vitality, improved balance, a stronger immune system, and better circulation. Qigong is held every Tuesday at 11:30 am - 12:30 pm. Stories and songs and a craft . . . oh my! Pajama Storytime and Craft is held every Tuesday evening. Recommended for children 3-7. Either pajamas or regular clothes may be worn. The PB Book Discussion Group welcomes you to join us on the first Wednesday of every month. At May's meeting we will discuss Killers of the Flower Moon: The Osage Murders and the Birth of the FBI by David Grann. Copies are available for check-out at the PB Library's Circulation Desk. June's selection will be The Left Hand of Darkness by Ursula K. Le Guin. With fun poses for parents and kids, Toddler Yoga also includes stories and a bit of singing! Toddler Yoga is held on the 1st and 3rd Thursday of every month. Please bring your own towel or yoga mat. Stories and songs for preschoolers (ages 2-5). Chair Yoga promotes stretching, strengthening and improves balance, increases circulation, enhances mental clarity and provides peace and relaxation. Please wear comfortable clothes; it is best to practice bare-footed or with socks. Chair Yoga is held on the 1st and 3rd Fridays of every month from 10 to 11 AM. Pick up a free comic book and then draw your own mini-comic book! This event is available all day. Kids can improve their literacy skills by reading aloud to certified therapy dogs. Wagging Tales meets on the first Saturday of every month at 10:30 AM, and is held in the Children's Area. Let's play chess! Do you prefer slow chess, blitz chess, clock, or no clock? We've got you covered. We will play friendly casual chess in the Community Room. Later, depending on group interest, we may have some fun tournaments. All ages and skill levels are welcome. Chess at the Beach will be offered on the 1st Tuesday of every month, and will be held in the Pacific Beach Library Community Room from 5:30 to 7:30 pm. Players of all ages and levels of experience are welcome for casual play. Please bring a chess set if you have one. The Friends of the Pacific Beach Library meets every month (except July, August and December) in the Library's Meeting Room/Gallery to discuss business, events, and other matters of interest to the FOPBL and to the Pacific Beach Library. Attendance is open to anyone. Drop in and see how you might be able to help support your library! Toddlers will learn basic dance and movement skills, creative expression, coordination, and self-control while dancing to popular children's songs. Dance Party is held on the 2nd Thursday of every month. Join us after Dance Party for a short film on the library's Big Screen! Our Community Room will be transformed into a theater where children are welcome to enjoy films, fun, and friendship together. Baby Blockbusters is held on the 2nd Thursday of every month. All skill levels are welcome to participate in this Spanish conversation group. Hablamos is held on the third Friday of every month from 1:00 to 2:00 PM. Learn how to knit so that we can KNIT our community together while we work on our own projects. Please bring yarn, needles, and your project and join Eileen Adler on the 3rd Tuesday and the 3rd Saturday of every month.